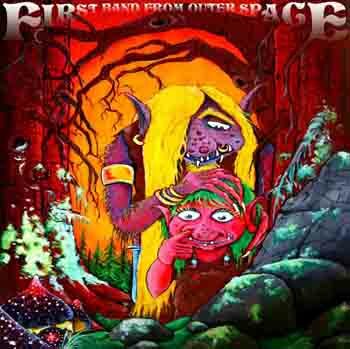 This is the first release from FBFOS in a few years now and they have added a second guitarist and keyboard player (who also plays guitar) and gone are the flutes, and added percussion. This material was recorded in 2008 in the bands own studio in Göteborg, Sweden. It is a fantastic vinyl only release (at this time) and features great artwork, a nice poster and is pressed in 300 copies. Side A features two long tracks and starts off with the amazing Demons & Haze. A long 10 min track with a great guitar solo by Johan in the middle. This is a really melodic and spacey track, and one of the best the band have made. It has a lot of moods and great elements. Turn left to the Mexican BBQ is next and also around 10 minutes in length. It starts off quite slow and spacey with some really nice organ synth and acoustic guitar. But hold your horses as this one really takes off. Johan lays down another great solo and a female vocalist throws in some rally forceful vocals as the band really fly out into space. Great track. The B- side is the long title track, which is based on a jam the band had but then later refined with some overdubs to make a really cool song. It is quite a journey this one. Hard to describe this one but sit back and enjoy the 20 minute track. Rumour has it that Transubstans will be released this on CD later this year. I hope with some bonus material.